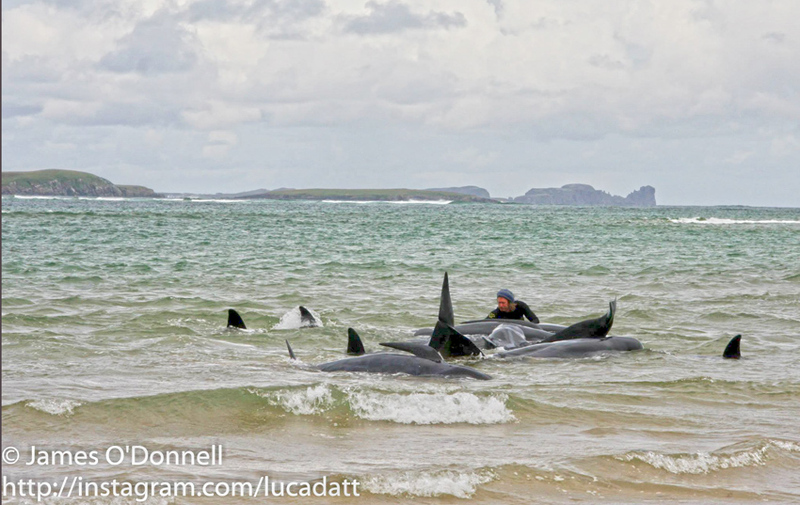 Stranded pilot whales buried alive? Below is a more extensive story to the one I wrote for the front page of yesterday’s (Monday) ‘Donegal News’ on the seeming lack of co-ordination, expertise and simple know-how that led to the tragic deaths of a pod of 12 young and adult pilot whales from slow suffocation at Ballyness beach near Falcarragh last week. 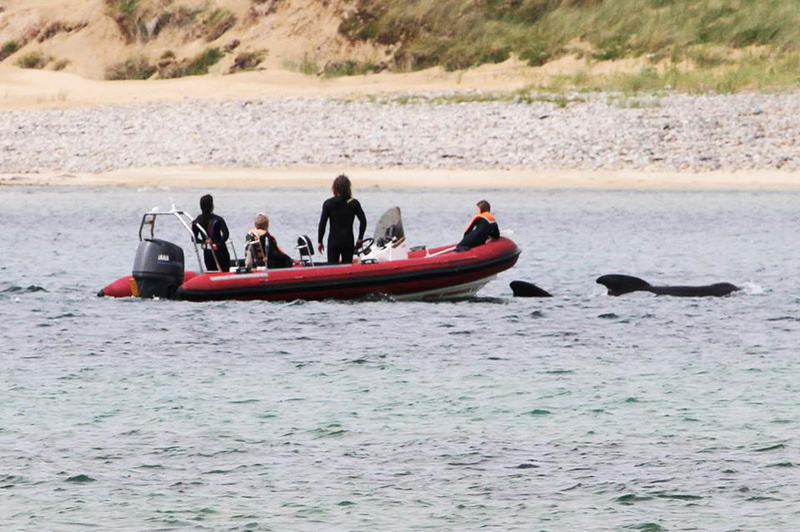 Following public outcry over how 12 pilot whales were left by conservation officials to suffocate over the last week at a west Donegal beach, talks have been initiated between the Irish Whale and Dolphin Group (IWDG) and the National Parks and Wildlife Service (NWPS) over alleged mistreatment. 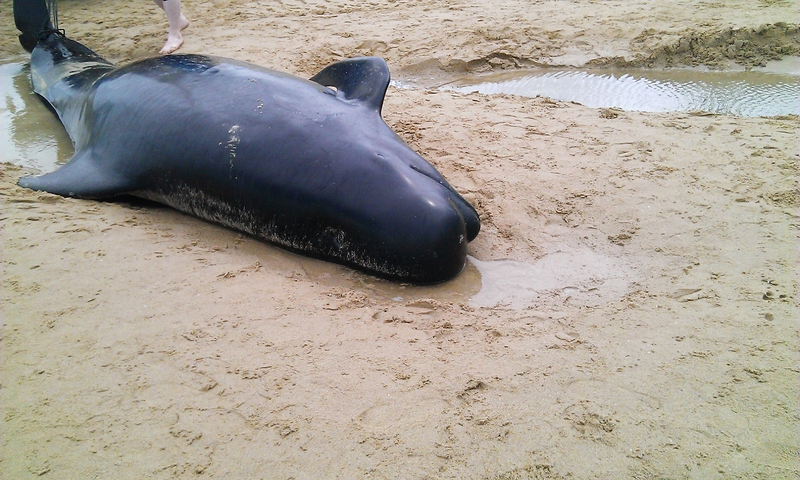 In a message from the founder and executive officer of IWDG, Professor Simon Berrow voicing concerns over the handling of some of the stranded whales at Ballyness beach near Falcarragh and the need for an immediate meeting with the NWPS. It is believed internal reports – mainly critical of the overall operation at Ballyness beach – are to be submitted within the next few days to higher levels of national management within the wildlife service. “We have so many lessons to learn for this mess,” one official said. Tortured whale draws its last breath. 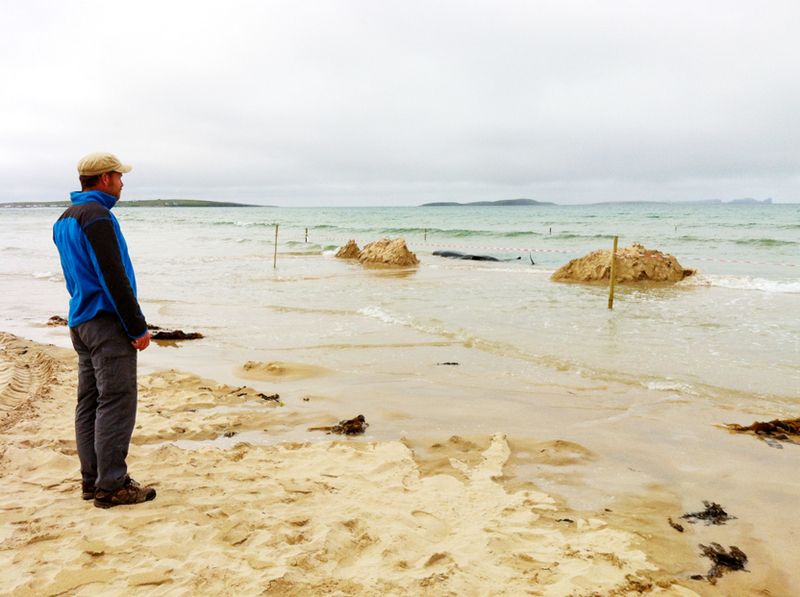 The message on the Selkie Facebook left by Berrow – a national expert on marine life who is a full-time lecturer at the Galway-Mayo Institute of Technology and has worked with the British Antarctic Survey and the International Whaling Commission – reflects confusion surrounding the handling of the situation at Ballyness beach. His communication highlights the lack of clear policy on such incidents in Ireland, not only with regard to which organization should be in charge but how to conduct a proper assessment about how the whales should be treated. After founding the IWDG in 1990, Berrow also helped establish the Irish Basking Shark Study Group in 2009. 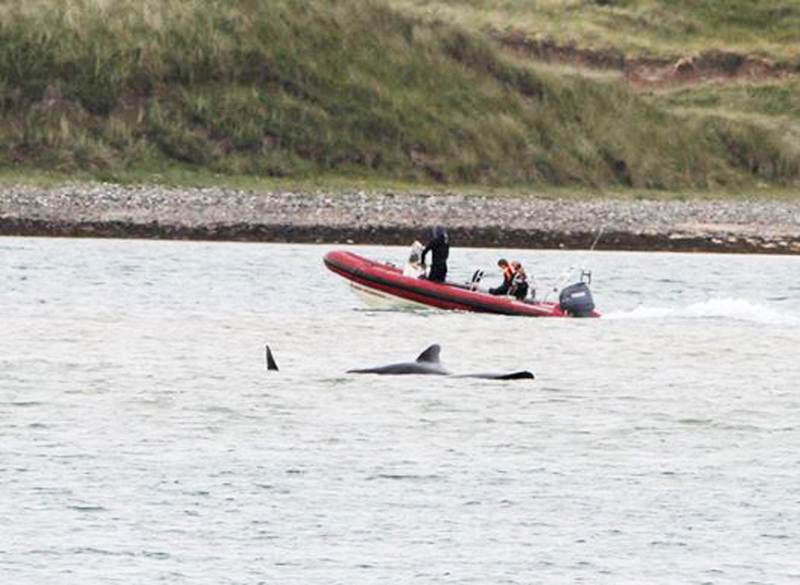 Environmentalist and wildlife lover, Gareth Doherty, tries to assist struggling whales at Ballyness beach. A clear SOP (standard operating procedure) for dealing with whale strandings has become ever more important in Donegal as the ‘Ballyness tragedy’ is the 13th such incident in the county this year, not to mention the pod of 32 whales that died in Rutland Island two years ago that were cut up and transported to Cavan for incineration. 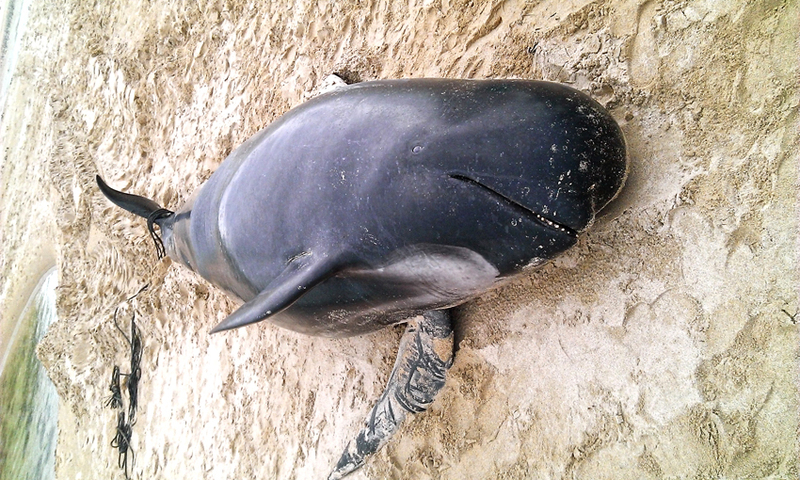 A minke whale’s body was discovered off Bloody Foreland and left there on the rocks below a cliff to rot for two months and sperm whale was washed up on Magheraroarty beach and died. Outdated protocol? Wildlife service official watches on while whales die slowly from suffocation. In addition, those in charge at Ballyness could have availed of one the IWDG’s ‘live stranding kits.’ These kits are located in three strategic places around the country and “are designed to cater for animals up to 4m long and contain air mattresses, tarpaulins, veterinary equipment, torches, buckets etc. 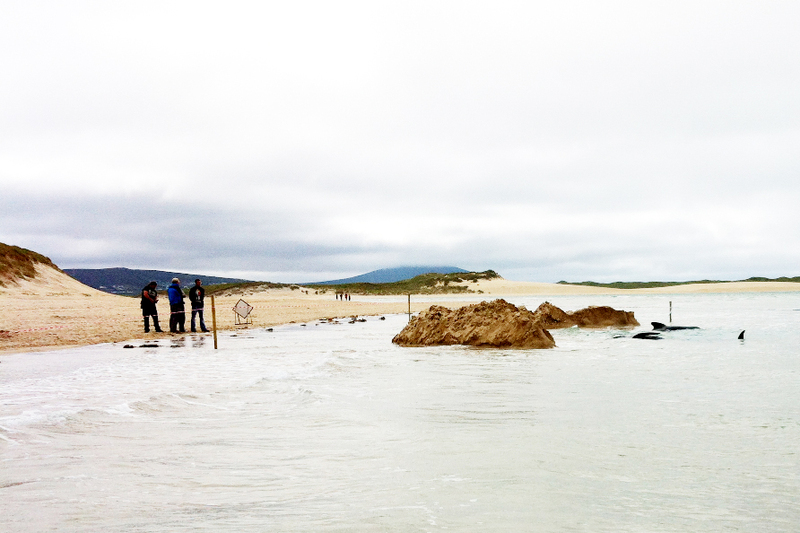 The pontoons are used for reflotation of larger animals, to about 6m in length, and if necessary, the smaller kits may be used to stabilize these animals while waiting for the pontoons to arrive.” Reports indicate that no such equipment was brought to Ballyness beach nor concerted efforts made to transport the whales back to deeper water. None of these three locations is in Donegal, even though so many whale strandings take place here every year. 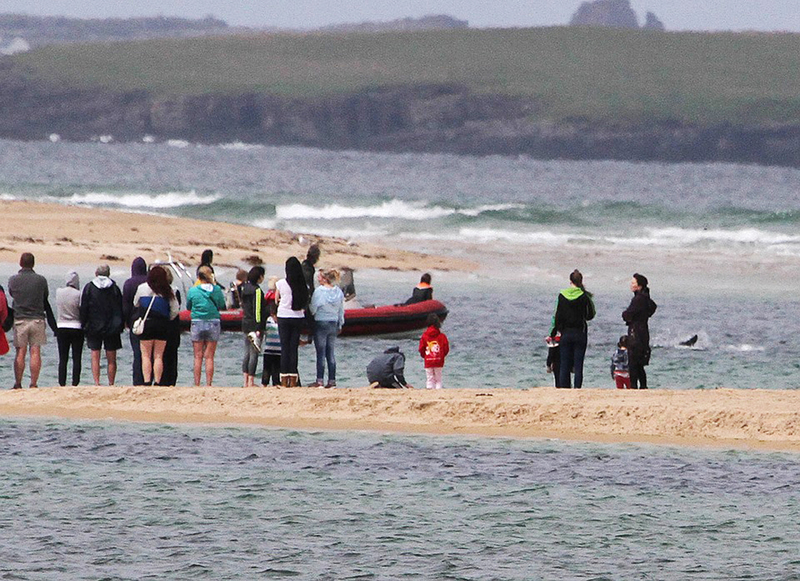 While in other parts of the world people assist in saving stranded whales, (see video of a humpback whale successfully rescued after being beached for 38 hours in Australia), at Ballyness beach wildlife authorities in charge deliberately discouraged people from helping, with one woman who was bathing a dying whale’s eye in saltwater to comfort the mammal was told to leave the scene or she’d be forced to do so. Meanwhile, hundreds of people who arrived at the scene of the carnage at Ballyness, many of whom came there to help, were left disgusted at what they witnessed, as reflected in letters to the editor printed in local newspapers and on-air radio and television comments. Their concern for better co-ordination and more humane treatment of the mammals, including euthanasia where necessary, is being harnessed in a special petition that has been launched HERE. It is a petition well worth signing. 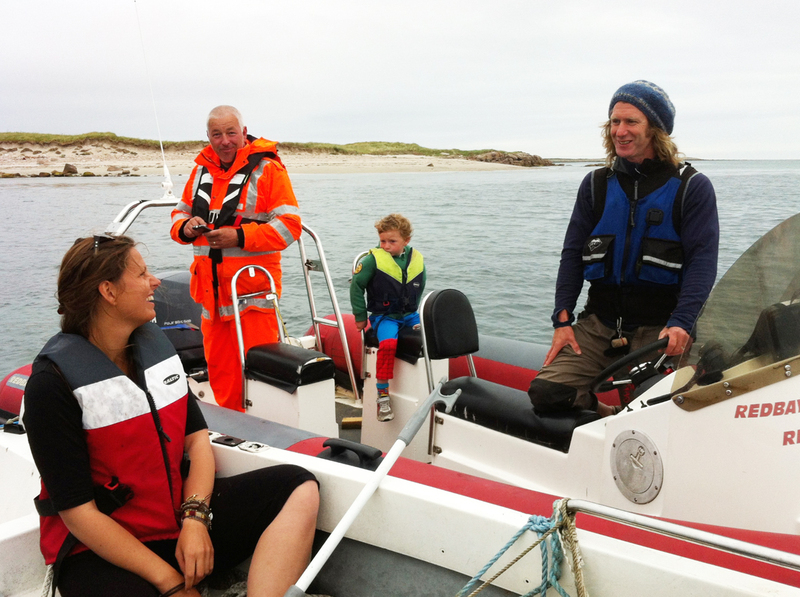 In a future blog: Toxic waste dumped at sea off Donegal’s coast – hazard to human as well as marine animal health? The inside story.